That is a gooey one alright. Release the schmoo! My Rami was the most gooped up with cosmo -INCLUDING DRIPPAGE IN THE MAGAZINES. I'm interested to know what grain bullets shoot the tightest groups in the CZ. My Berettas really like 165gr FMJ, 155gr... Not so great with 180 gr. I do have a bunch of that 135gr Winchester border patrol over run from moons ago, but haven't noted its accuracy in past outings. Seems like every time I got the hots for 75 in .40, I switch gears towards the P09 in .40 as something "different" for me since it holds 5 more rounds in the mag. Never did pull the trigger, however and can't say that Ive ever held one in the wild, either. I'm glad to see that MecGar offers a couple more rounds for the 75B in .40! I had a faint memory of having bought a spur hammer for another project I never started, so I went to the garage this morning to look through my parts containers. FOUND IT! Good thing, too, as they have been out of stock at CZ USA for awhile now and I couldn't find them online anywhere else. 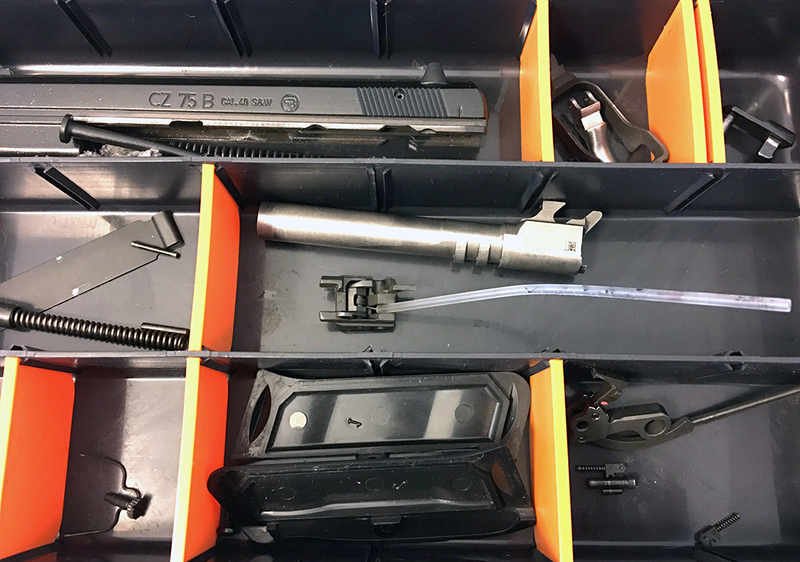 So, having the hammer in my trembling fingers I got on the CZ USA website and ordered the CZ85 slide release levers, a set of the soft rubber grips, a spare recoil spring, a flat magazine break (not for this .40 but for the old Pre B CZ85 that had the bent/twisted one in it that I just left out during that project/build), some stainless steel grip screws (I'm somewhat lazy and hate putting oil on the grip screws on a regular basis and then brushing/wiping it out/off), and a lanyard loop style main spring cap. I'll hold off on the other stuff till after a range trip or two. Won't know if it needs a CGW barrel bushing till after I shoot it some. Either way, at that time I'll get the CGW reduced power trigger return spring, firing pin block spring, firing pin retaining pin and do some polishing. Too bad CZ USA doesn't ship with the speed CGW ships with, but that's the way it is. When I'm done with it I'll have the Pre B CZ85, the CZ75 Compact converted to CZ85 controls (CZ85 Compact/clone) and the CZ75B .40 with CZ85 like controls. Liked it enough to order another one before they are gone. 1st one that just came in was test shot in December 2018. Got my order from CZ USA yesterday. Now, a rainy weekend. I was planning on waiting till after I'd shot it some before replacing parts and have not ordered the CGW parts (reduced power springs for the trigger and firing pin block, and adjustable sear, maybe something else I can't think of right now). But now I may end up working on the pistol some today/tomorrow. Between the rain and messing up my back a few days ago I've not been getting outside to do much anyway. Might get the tool box out of the garage when I get the dogs out later this morning and come on back to the kitchen table for some "therapy" for the pistol and me. Well, funny, funny, funny stuff happens. Started on on the new CZ75B but remembered the new mag. brake for the Pre B CZ85, so I grabbed it when I was in the garage and brought it in for a "quick job". You know how that goes. New brake grabbed the magazines and wouldn't let them drop. A little tweaking to flatten the loop at the top pin forced the top of the brake (where it was dragging) to the rear when the pin is installed and that resulted in dropping mags when the mag. release is pushed. Put the grips back on and no dropping mags. First though was the grips interfering with the brake but it ended up being the grips suddenly (never did it before) interfering with the magazines. Loosened up the screws one turn each and have dropping magazines. Then I got back on the new CZ75B. Guess what? The 14 round MecGars hang like a big dog when inserted into the mag. well. Four or five insertions and yankings back out resulted in a good part of the finish being scraped off the brand new magazines. The 12 round MecGars and the 10 round factory magazines work perfect. Then it hit me...do steel magazines really "swell" up? Took one round out of each of the three 14 round magazines and they all insert and drop free perfectly. Anyone else have an issue with the MecGar 14 round .40 S&W magazines? I've got several of the 19 round 9MM versions and none of them exhibit this issue when loaded to 19 rounds. 2) open up the bottom of the mag well in the frame as that's where they drag. I did get the frame modified for the CZ85 right side slide release. Just have to get it all back together and see how that works. Got some pictures, but stopped to take a break and eat supper. I'll post a couple pictures later. No other work done, I should have already ordered some CGW parts (reduced power springs, floating trigger pin, etc. If you have the blue topped 12 round MecGars, they will take 17 9mm and function perfectly with a 9mm barrel. Tested this out on Friday and was quite happy with them. JRR, I might to that. Pictures of the 14 round Mecgars with the scrapes from dragging the frame of the CZ75B .40. A 12 rounder off to the left that doesn't drag and has no scrapes on it. If I remove a round and leave 13 in a 14 round magazine they go in without any dragging at all. Here's the pistol with the CZ85 slide release levers installed in the frame. The push upward and pop back down fine. But, I found more problems with the Mecgar 14 round magazines. A CZ85 looking .40 S&W pistol. Now I've got to get the parts to get the spur hammer installed and get that job done. The slide release (left side) would not raise up far enough to catch/hold the slide to the rear. At first I though it was the slide release installation not being quite right. I also felt the spring that holds the two slide release levers in the frame wasn't quite working right. It would not drop cleaning down into the slot in the right side lever and was riding very high in the channel it sits/moves in. I took a jewlers file and slightly opened up/smoothed up/deepened the slot in the right side slide release lever. That allowed the spring to sit down completely against/on the shaft/slot of the left side slide release lever. It didn't fix the problem. Very stick slide release rotation and it wasn't moveing upward far enough to securely lock the slide to the rear. Don't you just hate it when that happens. I've orderd a suitcase full of Mecgarus in the last 4 or 5 years and not had a single issue - till this time. Been thinking about it for awhile. 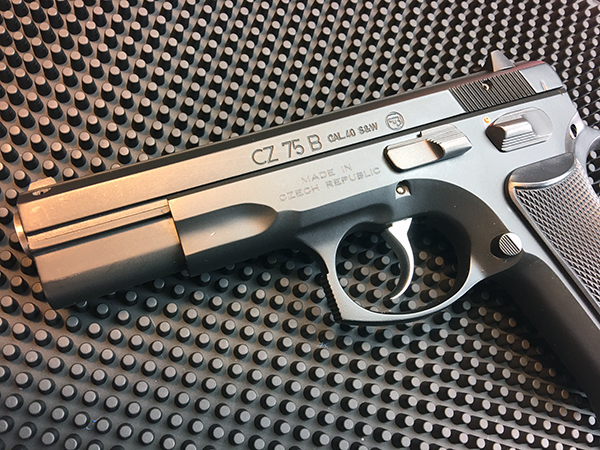 Occurred to me yesterday that a P07 in .40 S&W might be better for what it may become but after all of a few hours going back and forth I went with the CZ75B. I'm more familiar fiddling with them and replacing parts, etc. Easy to put a set of CZ85 slide release levers on one (like I did my Compact project a couple years ago). I can get some 14 round magazines for it (similar capacity to the P07's with the +2 bottoms on the mags). Probably wouldn't need as much to give it a sweet trigger (none of my other three have been more than 3.5 lbs. SA nor more than 9 DA). Can't convert to SAO someday if I feel the need. Harder/more expensive to convert to .357 SIG someday (if I get the urge). Pictures when I get it (hopefully won't be more than a few days. Congrats on the 75B/40! I have one of those and they are a fantastic gun. Looked at my picture, saw the trigger pull gauge and realized I forgot to put the stock trigger pull info in the post. Thought that was funny, both exactly on a even lbs. mark and the DA exactly twice the SA pull weight. The trigger pulls actually don't feel too bad. Not as bad as the numbers sound. But they will get better. Didn't have all the parts yet and got slowed down by the mag brake installation (Pre B CZ85) and magazine issues on the CZ75B and decided to wait till another day (and having the other parts on the table) to doing some stoning of the appropriate internal parts/places. Going to try and shoot it Tuesday if there's no snow on the ground at home. I hate losing brass. Residing in a land without snow, i had not considered that snow would eat brass. The brass is just fine when you gather them after the thaw. The hot brass melts it way down and then quicky set in ice becomes difficult to remove. Took it apart last night and ready to do some polishing/buffing, as well as installing some reduced power springs and the floating trigger pin. The plastic guide rod's gotta, too. I will pick one up later. I think that's good for now. 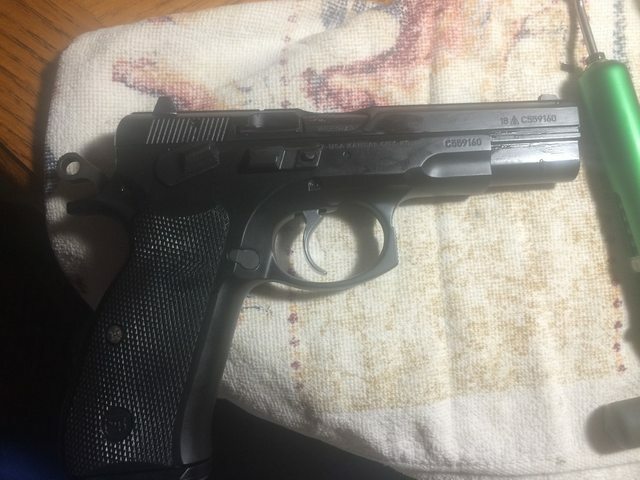 Quick update (4/17/2019) - Polished and buffed the internals and replaced the factory hammer spring with a 15# spring, floating trigger pin and reduced power trigger spring. Since it is a range piece, I removed the FPB. You are getting some great da pulls! My 75B in .40 came home new with a 4# SA and 14# DA. It took a lot of polishing to get the DA down to the 10# range. Remembered to get the pistol/magazines (which were loaded with the 140 grain bullets) but forgot to grab a jug of the 135 grain Noslers. 100% function with the reloads (a whole 12 rounds). Accuracy was, well, okay. I’ll need to evaluate it further with the hollow points and some more shooting. Groups were off to the right about an inch & 1/2. I know, in my P07/P09 the 140 grain MB's shoot to the same point of aim as my 135 grain hollowpoint loads. But the hollow points shoot tighter groups. I just forgot to take some of the hollow points with me this trip. Walked back to the house and clean up was like cleaning the P07 .40. Three passes down the barrel with the brush, two passes with a patch and the barrel was clean and shiny. No traces of lead/crud. I like that. 19 round Mecgar 9MM magazines loaded with 9MM insert with a small amount of drag and will drop out when the mag. Release is pushed. 19 round MecGar 9MM magazine will just barely take 14 rounds of .40 S&W (just like the last round in the Mecgar 14 round .40 magazines makes you think you’re going to break the maglula) . Once you get 14 rounds of .40 in the 19 round 9MM magazine it becomes difficult to insert into the mag. Well. 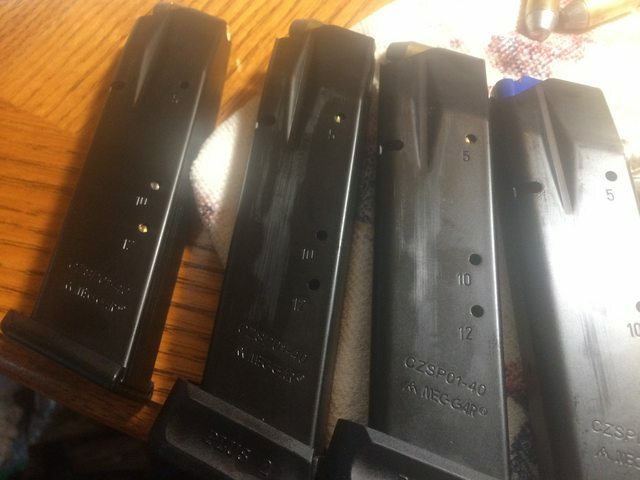 Looking at the tops of the .40 S&W and 9MM magazines they appear to be very close if not identical, so they could be used for either caliber but I guess they’ll work better as 9MM magazines if I want to fully load them to the factory spec./capacity. I thought about opening up the mag well on the new CZ75B but that won’t change the magazines being so difficult to load, even with the maglula. Guess I'll just order standard 12's from now on. Can't see paying extra for 14's that I can't load to 14 without "fighting" them to get 14 in them and then fighting them to get them into the pistol's mag. well.